JNN 15 Nov 2014 Riyadh : Concerns are rising among Muslims over Saudi Monarchy’s controversial plan to demolish the birthplace of Prophet Muhammad (PBUH) in the holy city of Mecca. The UK-based Islamic Heritage Research Foundation said on Wednesday that the House of Mawlid, where Prophet Muhammad was born in AD 570, is planned to be destroyed by the end of the year and replaced with a royal palace for Saudi King Abdullah ibn Abdilaziz for his visits to Mecca. “The site of the Prophet’s birthplace has again come under imminent threat of being permanently forgotten under concrete and marble,” said Irfan Alawi, the executive director of the foundation. “Now that Hajj is finished, the 24-hour construction work has started again. They have finished the expansion on one side of the mosque (Masjid al-Haram). The royal palace, which will be five times bigger than the current royal palace, is to be built into the side of a mountain and will overlook the mosque,” he added. Holy Kaaba, that is Islam’s holiest point, has been encircled by arched porticos erected some three centuries ago by the Ottomans, above dozens of carved marble columns dating back to the 8th century. 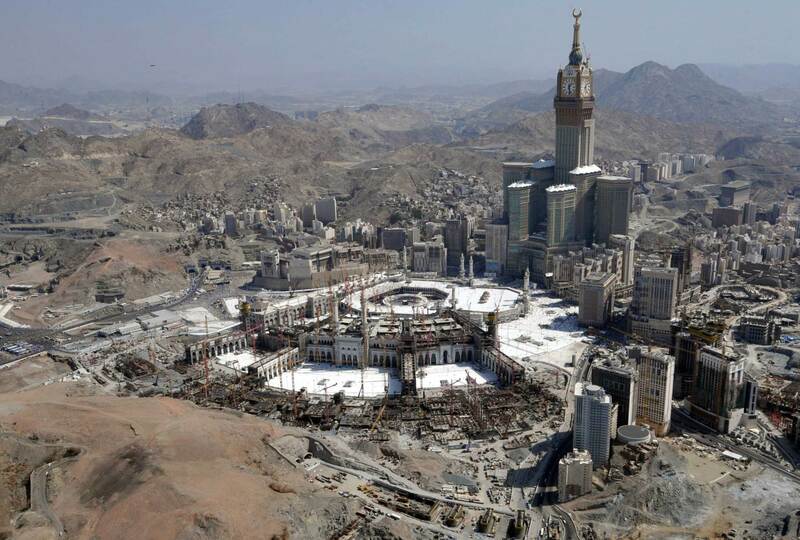 But earlier this month, any vestiges of the portico and columns were reduced to rubble, cleared to make way for the Saudi government’s expansion of Mecca’s Grand Mosque. The Destruction of the Holy and sAcred Places of Islam is done under a Multi billion project, launched in 2011, under the Pretext to meet the challenges of accommodating the millions of pilgrims who visit Mecca and Medina every year. Around 2 million currently visit during Hajj alone, the annual pilgrimage that happens during the last month of the Islamic calendar. But it is actually the destruction of the Holy Places are part of a much wider government campaign to rub out historical and religious sites across the Kingdom. As the Monarchy wants to Implement its Wahabi Ideology , which restricts any type of Religious sites and Places . Last week, Saudi officials destroyed the historic columns commemorating Prophet Mohammad’s ascent to heaven. Though the Saudi rulers have a long history of destroying historical sites, activists say the pace and range of destruction has recently increased. A few months ago, the house of Hazrat Hamza, the Prophet Muhammad’s uncle, was flattened to make way for a Meccan hotel, according to Irfan Al Alawi,executive director of the Islamic Heritage Research Foundation. There have even been rumored threats to Prophet Muhammad’s tomb in Medina and his birthplace in Mecca. Dr Alawi, one of the few voices to publicly oppose the destruction, claimed that religious police are posted outside the library to prevent worshipping. Wahhabism, the prevailing Saudi strain of Islam, frowns on visits to shrines, tombs or religio-historical sites, on grounds that they might lead to Islam’s gravest sin: worshipping anyone other than God. In recent years, the twin forks of Wahhabi doctrine and urban development have speared most physical reminders of Islamic history in the heart of Mecca. The house of the Prophet’s first wife, Khadijah has made way for public toilets. A Hilton hotel stands on the site of the house of Abu Bakr, the famous Companion of Holy Prophet . 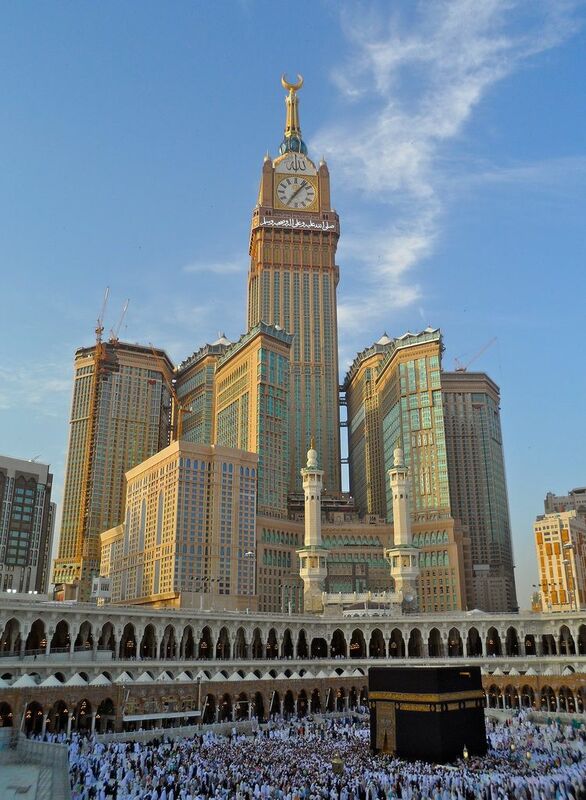 While the Kaaba now stands in the shade of one of the world’s tallest buildings, the Mecca Royal Clock Tower, part of a complex built by the Bin Laden Group, boasting a 5-story shopping mall, luxury hotels and a parking garage. Saudi officials did not respond to interview requests, but in the past, they have always taken cover for their destruction of the Most Holiest Places of Islam , under the Pretext of expansion project , and it is not far away that they ll , if God forbidden gets a chance then they ll even some day , Destruct the Holy Grave of the Prophet Muhammad , as the Wahabi Mythology Doesn’t allow Paying respect to the Graves of the Holy People or of their Loved Ones . As the Monarchy is More concerned for the growing Business and the Profits they earn , due to the Holy Pilgrimage of the Muslims of the World , as it is the Most Sacred and Holiest Place of Islam , which they feel like it is the Part of their Kingdom, Only which can serve their Interest to earn More Profits , By Making 5 star Hotels and Luxury Malls around the Grand Mosque , which has made the Holy Pilgrimage so expenses , that now Only Wealthy Muslim can Perfom the Holy Pilgrimage , while they have not done any steps to Minimize or Subsidies the cost of the Pilgrimage for the common Muslims , or have allotted any subsidies for the common Muslim so he can also Perform the Dream come true Holy Pilgrimage for a common Muslim of the World. They are doing Expansion of only the Grand Mosque , which contains the Holy Kabaa , while all the other Important and the Most Sacred and Historically Important Places for Islam they have already Destroyed and Rest of the Remaining few they are Planning to Destroy and Destruct , By Implementing their Wahabi Ideology and Rest By asserting their Power and Influence Upon the Weak Muslims . While the Monarchy like all the Monarchies have even their Courtyard Clerics , who even defend all their Plans and Ambitions under the Flag of Islam , as The Arab country’s Grand Mufti, Sheikh Abdul Aziz Bin Abdullah al-Sheikh, recently defended the demolitions, saying they are necessary in boosting the capacity of the mosque. This entry was posted in Islamic Events, Jafria, Middle East and tagged Holy Kabaa, Holy Prophet, Irfan Alawi, Islamic Heritage Research Foundation, Islamic Heritage Research Foundation Holy Kaaba, King Abdullah, saudi king abdullah, saudi monarchy. Bookmark the permalink.